Communities of faith have great opportunities for welcoming, supporting and encouraging children with special needs and their families. Some churches have been including individuals with developmental disabilities who were first brought by their parents as babies, others have developed special ministries in outreach for adults in their neighborhood or region, and some recognize that disability is just an extension of the diversity in every community. There are many groups, organizations and resources to tap into for supporting children with special needs – but more are always welcome. Every congregation has children with special needs, whether you know who they are or not. 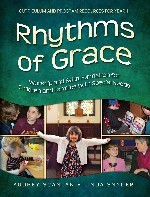 Rhythms of Grace by Audrey Scanlan & Linda Snyder is a unique and innovative program resource designed to meet the spiritual needs of children and families living with autism spectrum disorders. Participant families gather monthly with program leaders and volunteers for sessions that are a hybrid of worship and faith formation. Rhythms of Grace helps children and their families feel at the center of a worship/formation experience that is specific to their needs and circumstances, rather than merely at the margins of a more conventionally “inclusive” program of worship or faith formation. The curriculum consists s of distinct scripture-based session plans, as well as the background material needed to establish a successful program. Visit the Connecticut Rhythms of Grace website as well as The Lighthouse Program with four churches in Houston, Texas.